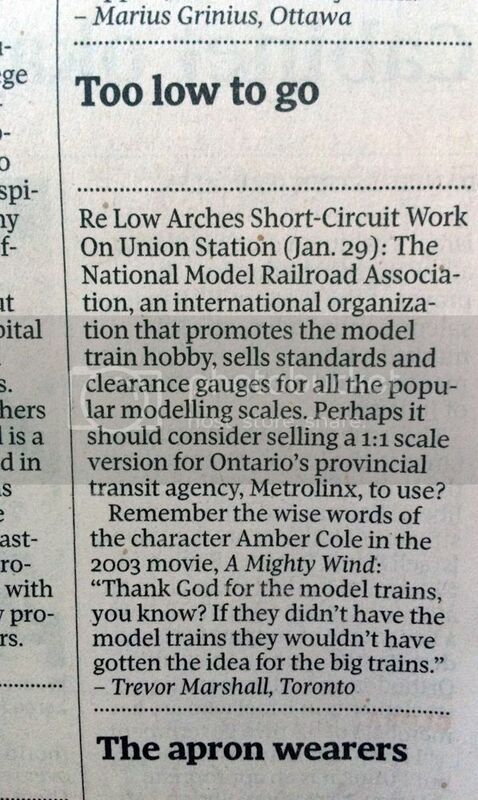 This entry was posted in Beyond Port Rowan in S, layout design by Trevor. Bookmark the permalink. In between uses just imagine the tourist interest as well. Nothing like getting the family’s photo snapped in front of the 1:1 standards gauge while on vacation in Toronto. But the NMRA Standards Gauge does not account for the placement of overhead wire for electric operation. It is only for clearances for equipment. There were probably a bunch of design engineers in a room somewhere saying: “It should work”, after the initial designs were completed. Metrolinx needs to learn what a 3rd rail shoe is. Maybe they could find some old FL9’s to rebuild. Third rail would make infinite sense. Which is probably why they have not thought of it yet. No problem, just add a wee space above for a wire. How much room can that take? The whole idea of electrification is complete BS anyways. Just another way for a corrupt government to send more tax payers money to their buddies. Or, use something less than 25kV in the shed at Union, and use some sort of electronic control gear on the engines. Also, use a rigid overhead, rather than a flexible overhead. Problems solved…it may be expensive in some ways, but it may be cheaper in others.